Certain kinds of bias … are obnoxious. Bias for impartiality is as much a bias as is partisan prejudice, though it is a radically different quality of bias…. One can only see from a certain standpoint, but this does not make all standpoints of equal value. How does supervising dental hygiene factor into an associate’s compensation? When is a Practice Valued? A dental associate’s the most favorable proposition is to have the practice valued before beginning to work in the office based on the past 3 to 5 years of practice financial data and without factoring-in the associate’s future earnings for the practice. This scenario leads to a much higher likelihood that the practice sale will eventually occur, largely because both the owner and the associate know “up-front” the value of the practice, avoiding sticker-shock, and potential misunderstandings. Even in this situation, it is reasonable that the fair-market-value (FMV) of equipment added during an associate’s employment would figure into the practice price when the associate buys or buys-into the practice. A somewhat less favorable situation is for the practice to be valued on the past 3 to 5 years of practice financial data with an agreed upon inflation index or index of practice growth agreed upon in advance. Again, an adjustment for FMV of equipment would be reasonable for both parties. The least favorable situation for the associate is for the practice to be valued after the associate has worked in the office for several years, and factoring the associate’s earnings for the practice into the valuation process. In this scenario, the practice valuation includes the associate’s “sweat equity” from potentially several years. From the owner’s standpoint, the associate hasn’t been an owner up until that point, and so, including the associate’s financial contributions to the practice is reasonable. Dental hygiene is an incredible profit center for a general dental practice. The most favorable situation for an associate is to receive compensation for supervising dental examinations and perhaps a percentage of the hygiene department’s procedures such as 1/3 of all radiographs taken. An associate receiving compensation only for supervising dental examinations can result in significantly more income for the associate and almost certainly less profit for the owner. For example, an associate might supervise two full-time dental hygienists performing 70 dental examinations every week for 48 weeks at $50/examination. That results in $168,000 in potential collections. An associate is often paid on a percentage of ∼30%± of clinical production or actual collections: $168,000 × 0.30 = $50,400. The least favorable situation for an associate is for all of the hygiene department revenue to attend to the practice owner. How Do the Answers to the Two Questions Manifest in Bias? Undefined or poorly defined assignment/allocation of practice patients which often, by default, results in the owner providing dental care to patients with the most financially rewarding procedures and the associate providing more routine operative dental care. Undefined or poorly defined expected work schedule. Undefined or poorly defined compensation system. Undefined or poorly defined work benefits. Undefined or poorly defined conditions justifying dismissal. Undefined or poorly defined structure for how the laboratory bill is paid and by whom. Undefined or poorly defined staff support for the associate and the associate’s role in hiring, training, and supervising staff. Undefined responsibilities for caring for emergency patients. Unknown or incomplete financial information about the practice (overhead, adjustments for public and private third-party insurance payers, collection/production percentage, etc.). Undefined space availability for associate (who will eventually need at least two operatories soon after beginning to work). Unusually restrictive and potentially unenforceable covenants not to compete (against the owner should the associate leave). And perhaps without needed to be stated here, unknown or poorly defined plans to buy-in or buy-out the practice. 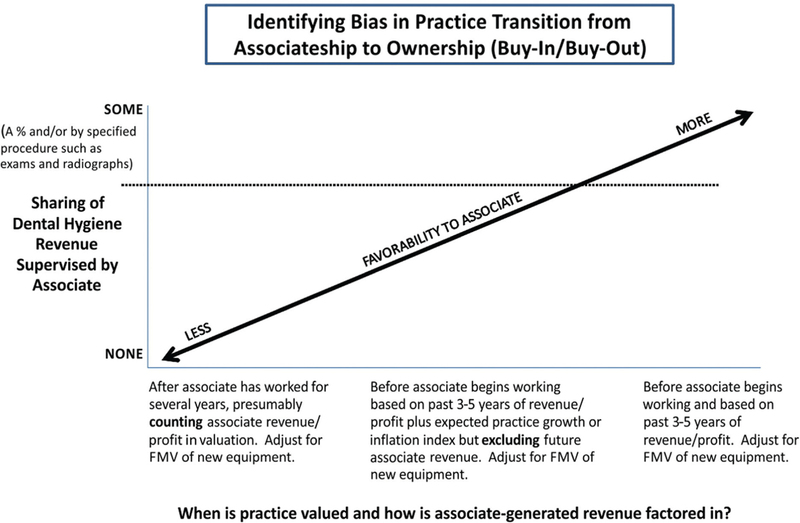 Figure 1: Identifying bias in practice transition from associateship to owner (buy-in or buy-out). In other words, ignoring the topics of when the practice will be valued (let alone how!) and associate compensation for supervising dental hygiene commonly cascades into a series of other topics not discussed in the transition. None typically benefit the would-be dental associate; and many create unnecessary confusion and potential conflict. Further, the absence of some of the information makes vetting the associateship opportunity very difficult. With student debt on the rise, associates more than ever have to fully understand the economic opportunity being provided in an associateship. On the other hand, if there is a discussion of when the practice will be valued, an admittedly difficult conversation, and if the associate will receive some compensation for supervising dental hygiene, other potentially troublesome issues tend to be addressed/defined for the associate, creating more clarity, and preempting future conflict. It is critically important for an owner and an associate to fully discuss the answers to the two pivotal questions raised in this essay. Doing so will facilitate a more successful associateship experience and help to avoid areas of confusion and ambiguity. The author is a co-editor of one of the books cited in the references. He also has editorial involvement with Dental Hypotheses. Boydston JA, editor. The collected works of John Dewey, 1882–1953. Later Works;6:14–5. Callan R. Chapter 20: About associateships In: Dunning DG, Lange BM, editors. Dental practice transition: A practical guide to management. 2nd ed. Ames, Iowa: Wiley 2016. pp 349–68. American Dental Association. Guide to associateships: Success strategies for dentist-owners and prospective associates. Chicago, IL: American Dental Association; 2013. Dunning D, Lange B, Madden R. Compensating associates for supervising dental hygiene production: A discussion of an often taboo topic. Dent Hypoth 2010;1:85–93. Nadershahi NA, Lyon LJ. Chapter 7: Buying/buying into a practice. In: Dunning DG, Lange BM, editors. Dental practice transition: A practical guide to management. 2nd ed. Ames, Iowa: Wiley 2016. pp 113–32. Dunning DG. Walking with dental students through the minefields of associateship opportunities. Dent Hypoth 2011; 2:83–6. Dunning DG. Associate to owner transition—When should a dental practice be valued? Dent Hypoth 2011; 2:113–7. Wolff S. Chapter 5: Understanding practice valuation. In: Dunning DG, Lange BM, editors. Dental practice transition: A practical guide to management. 2nd ed. Ames, Iowa: Wiley 2016. pp 85–96. American Dental Association. The ADA practical guide to valuing a practice. Chicago, IL: American Dental Association; 2013. Heller E. Top ten reasons associateships fail. Preview 1999;12–7.